Note: There has been substantial misperception or partial information about the role of Montreat during World War II when it housed Axis businessmen, diplomats and their families while awaiting exchange with Axis powers of American diplomats and their families. Part of this misinformation is due to the current pejorative connotations with WWII internment camps operated by the U.S. War Department. 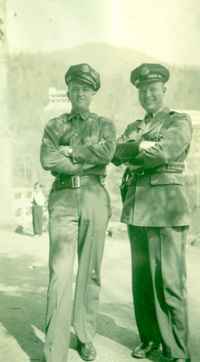 This Montreat History Spotlight provides background information and specific information on Montreat's wartime role. Please feel free to contact us with additional information by clicking here. With the sudden involvement of the United States in World War II as a result of the bombing of Pearl Harbor on December 7, 1941, by the Japanese military, diplomats from both sides were caught in what were now enemy countries. International protocol urged above average treatment of such diplomats, non-combatants (such as business executives and owners) and their dependents while awaiting repatriation, as well as provisions to ensure their safety. The Special War Problems Division of the U.S. State Department operated a small number of detention facilities during WW II. "Special war problems" included Axis-allied diplomats, consular corps staff and their families, as well as executives from Axis-owned businesses located pre-war in the U.S. or in Latin American countries. These diplomats, non-citizens from Axis countries, businessmen and their families were housed in hotels, pending repatriation. The same was done in Germany for American diplomats and families, for example in Marienba., Missionaries, diplomats and others were held in Japan. In the U.S., these diplomats, businessmen and families were housed inland for short periods of time at Appalachian hotels and resorts, such as the Greenbrier Hotel, the Homestead, the Grove Park Inn, Ingleside Hotel, Shenvalee Hotel and Montreat's Assembly Inn. These diplomats and families began being transferred to these hotels on December 19, 1941. Everyday operations of these facilities were handled by the Immigration & Naturalization Service. One present-day author described the treatment afforded these diplomats and families as provided in	"a regal manner... the United States hoped its diplomatic officials would receive similar treatment." A State Department memorandum in 1942 reported that 785 people were interned in these hotels. Additional businessmen, diplomats and families were later added during 1943. 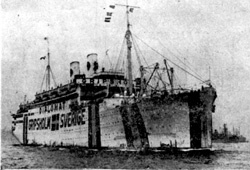 Exchanges of diplomats and families were made numerous times during 1942 - 1944 through neutral country ships at neutral ports. The U.S. used Swedish ships Drottningholm and the Gripsholm for repatriation on 33 voyages. The last internment hotel operated by the State Department closed on February 14, 1944. More details on these hotels and their wartime detainees are at lower right. Not all detainees were repatriated and many at the end of WWII stayed in the United States. In October 1942, State Department officials requested that Montreat provide housing for Axis businessmen, some diplomats and other non-citizens, as well as their families, for a short period of time. 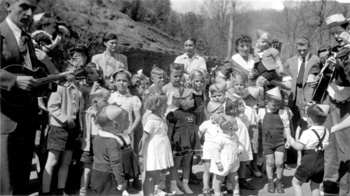 The Montreat Retreat Association agreed to house these civilians until April 1st (later extended to April 30), 1943, due to a planned meeting in Montreat for May 1943 by the General Assembly of the Presbyterian Church in the United States. On October 29, 1942, 264 to 268 businessmen, diplomats, wives and children were transported to Montreat. The German and other Axis allied countries contingent was housed on the two lower floors of Assembly Inn, with the Japanese women and children primarily on the upper third floor. The MRA placed a Japanese language New Testament or German-language Bible in the appropriate hotel rooms. The diplomats and dependents could exercise in the parking areas of Assembly Inn, and roam territory from the hotel to the lake, between the dam and the upper concrete bridge at the head of the lake. Two of the guards are shown at right. At Christmas time, presents were provided by the MRA to the Japanese and German children  paid for by contributions from the Sunday School of the First Presbyterian Church of Spartanburg and others. Reportedly on Christmas Eve 1942, young people from Black Mountain gathered at the lake bridge and joined in signing Christmas carols with the diplomatic families  singing "Joy to the World" and "O Holy Night." From the State Department revenues received by the MRA, $25,000 was held in reserve and used when the Historical Foundation building (Spence Hall) was constructed in 1954. More pictures from Elizabeth Barr's scrapbook will be posted later. If you or your relative were housed at Montreat during this period, the Presbyterian Heritage Center would like you to contact us. Thank you. Here is a rare color photo of some of the Japanese teenagers and a younger child in kimonos for a special occasion while they were in Montreat at the State Department Detention Camp for diplomats' and businessmen's families, while waiting for repatriation to Japan. Repatriation didn't occur for all before the war ended. 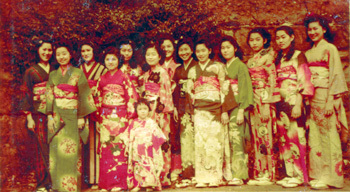 Left-to-right are: Michiko Okaji, Shizuko Carolyn Fujisawa, Shigeko Okaji, Taeko Carol Miyamoto, Kiyoko June Kiyohara, Miyeko Ella Ohta, Michiko Jane Asami, Sugako Isobe, Toshiko Marianne Matsumura, Nobuko Saito, Sumie Betty Ohta, Mariko Mary Kojima and Satoko Isobe. The young girl in front is not identified. Some of these individuals had resided in Hawaii before the outbreak of the war. German diplomats and children enjoy a guitar player (far right) at a small party on Assembly Drive near Lake Susan. 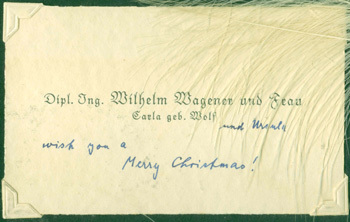 Here's a 1942 Christmas note from Wilhelm Wagener, wife Karla and daughter Ursula to Assembly Inn Clerk Elizabeth Barr (Bowers). 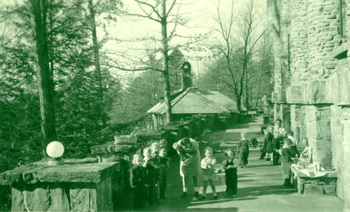 Children and others are shown on the patio outside Assembly Inn. 159 German, Italian, Hungarian & Bulgarian diplomats and family members from Washington, DC. ; plus 335 Japanese diplomats and family members from Washington, DC; Havana, Cuba; Mexico City, Mexico. December 19, 1941 - June 1942 The Greenbrier hosted a variety of diplomats and families from Axis countries, and eventually receiving the Japanese from the Homestead Hotel. While the exact number is not easy to determine, apparently the facility hosted up to 852 at various times during the seven-month period. 63 Japanese and 155 German diplomats and families, some who were serving at posts in Latin American countries at the beginning of the war with the United States. By one list, those detained were 133 Japanese women and children of diplomats; 131 Axis businessmen, diplomats, wives and children. Some were originally situated in Central and Some America nations when WWII broke out.. One State Department representative (Miles Briggs), an Interior Department representative and approximately 5 Justice/INS guards at any one time (up to a total of 25 guards) may have served over the period. Guards included: Louis Cates, Elmer Fisk, Russ Aveilhe, Sanders, Hart and Kersis. February 14, 1944  Justice Department closed the last of its program housing diplomats in confinement hotels. © 2012. Presbyterian Heritage Center at Montreat. Exception to copyright notice above; The Montreat History Spotlight is copyrighted by CSI/ISI, 2011.